I love handmade bars of soap that have a scent that stands out. Something good, of course, that can linger on my skin long after I've used it. Something that lathers up well and doesn't dry out my skin. 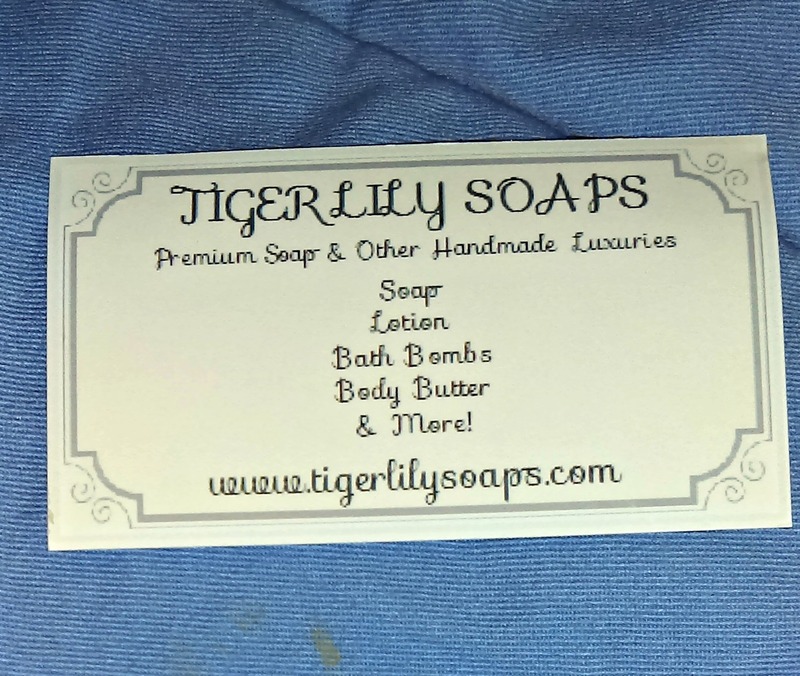 These soaps from Tiger Lily Soap are what I'm talking about. With an icy blast of spearmint and a hint of basil, this soap is an excellent way to start your day! Forget coffee! 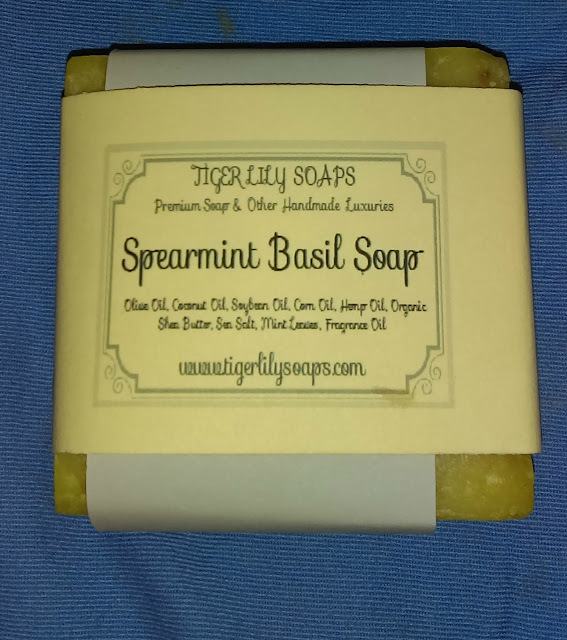 This combination of spearmint and basil is a great wake-me-up. The addition of sea salt and mint leaves makes for an incredible bathing experience. Saponified: Olive Oil, Coconut Oil, Soybean Oil, Corn Oil, Hemp Oil, Organic Shea Butter, Sea Salt, Mint Leaves, Fragrance Oil. I absolutely love the scent of this bar of soap. It's a strong scent, but not so strong that it will irritate your nose. It's uplifting and is great for using first thing in the morning or when you need to wake up, in my opinion. Although, you can definitely use it at any time of day that you choose. It leaves your skin smelling minty fresh and soft and moisturized because of the oils and shea butter. This soap has antibacterial properties in it as well. 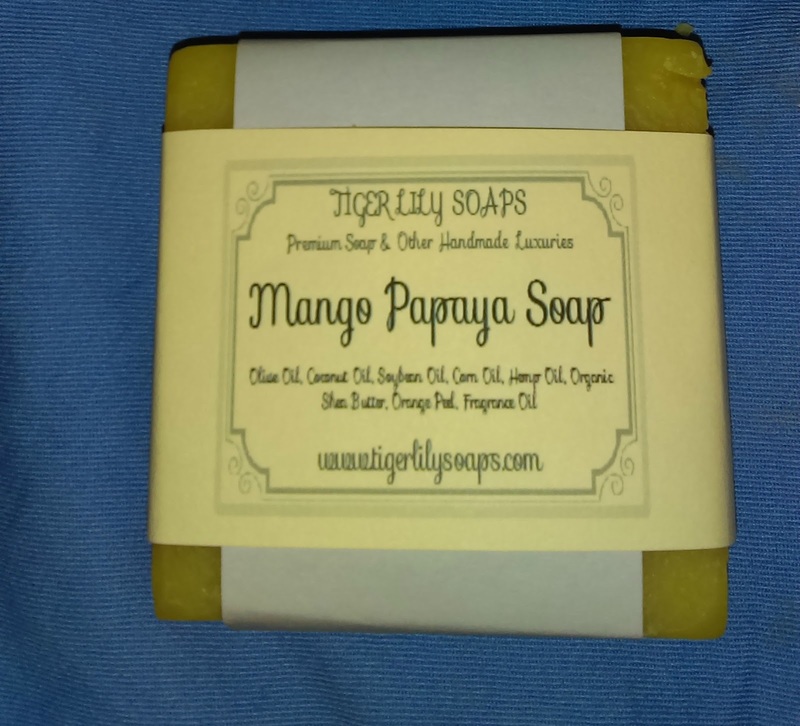 Studded with real orange peel, this juicy blend of mango and papaya scent will make you dream of the tropics! Buy some today and experience a tropical paradise in your shower! This is a very light scent that would be perfect for someone who is easily overpowered by fragrances. Saponified: Olive Oil, Coconut Oil, Soybean Oil, Corn Oil, Hemp Oil, Organic Shea Butter, Orange Peel, Fragrance Oil. Oh my gosh. I wish I could put this soap in front of your nose so that you can smell it. It smells delicious. It's as though you have the two ripe fruits sitting right in front of you. Oh, how I love that. It reminds me of my fruity smoothies that I have every morning. Also, leaves your skin moisturized and smelling like a fruit salad every time that you use it. Honestly, both soaps smell incredible. I love them both. My favorite of the two, however, is the Mango Papaya soap. I just can't get enough of it's smell. I keep finding excuses to wash my hands with it. Haha. Both of these, as well as the massive variety of handmade soaps with natural ingredients (listed on each soap bar label), would make such a nice gift to give. Or keep them for yourself! Put them in your bathroom and lather up as often as possible. You won't be sorry. There is a scent for everyone, from fruity to floral to relaxing, etc. Wonderful aromatherapy. They also sell bath bombs, lotions, gift sets, body butter, and bath salts. There's still time to get some before Christmas! You can see all of their wonderful products available here.